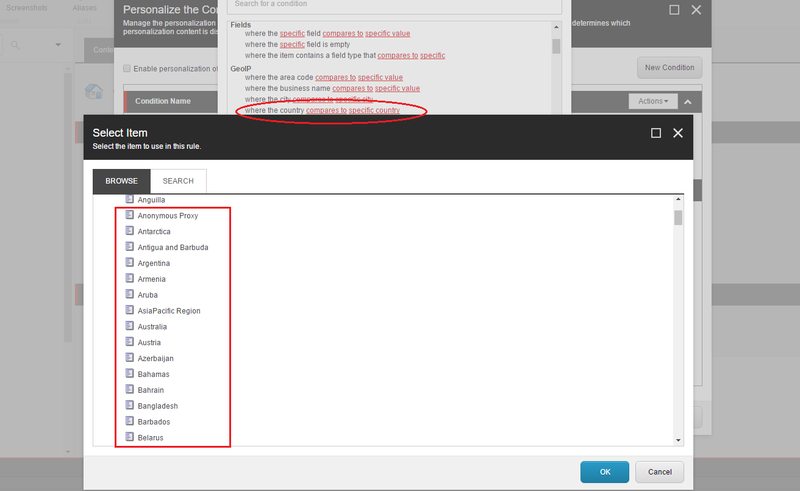 Sitecore Personalization using GEO IP is not executed . Install Sitecore IP Geo location Service package. Enable the Sitecore.CES.config, Sitecore.CES.GeoIp.config, and Sitecore.CES.GeoIP.LegacyLocation.config files. 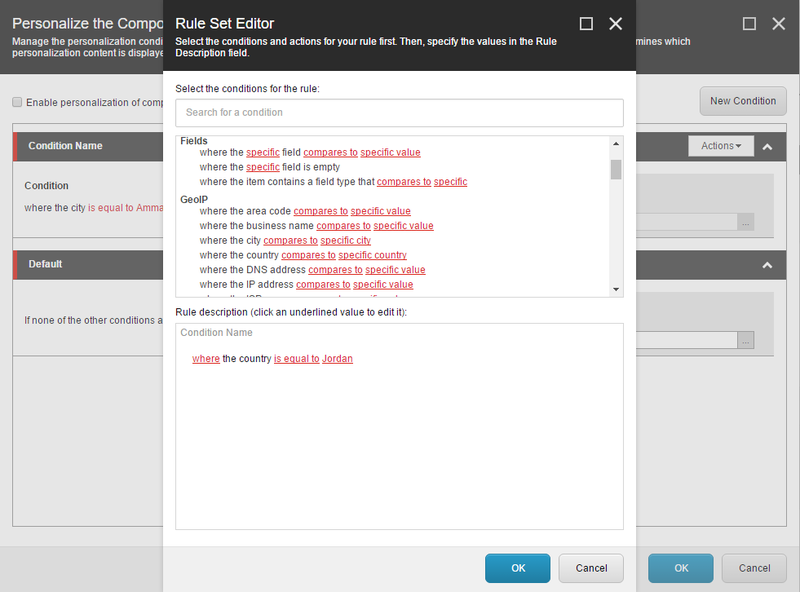 Then i added simple personalize rule as the attached image to hide one of the controls for specific country then publish the page but the rule is not executed. Firstly; Using the Service based Geo IP service is not recommended practice for personalization scenarios. The guaranteed response time for the service simply isn't fast enough - and it will slow down your site immensely if you put it in production. Secondly; and potentially exactly because of this; you could be experiencing the known issue referred to here. Personalization with Geo-based conditions does not work properly on the first visitor request. When using personalization or conditional renderings with rules based on the geographical information of the visitor (such as "where the country is equal to specific country"), the personalized content might not been presented to the visitor correctly on the first request. 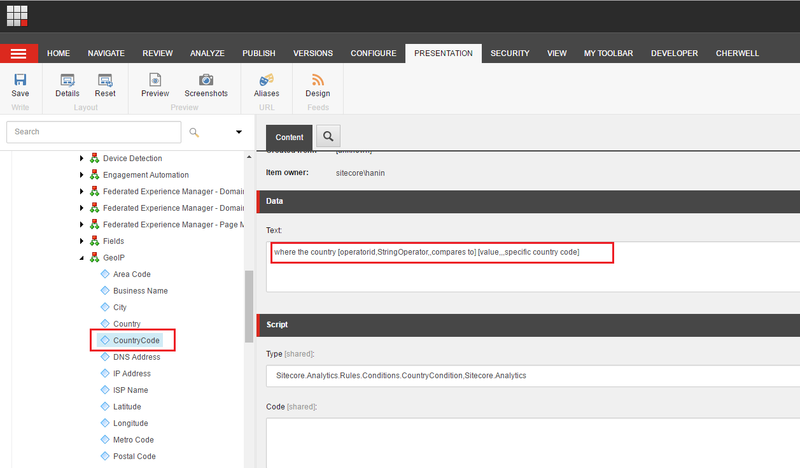 Such behavior occurs because Sitecore is designed not to wait until the GeoIP information has been resolved from a GeoIP lookup provider such as MaxMind. This is implemented to keep response time for the website visitors low in situations when the GeoIP resolution process is taking longer periods of time. The alternative is, to use a local Geo IP table so you can resolve these locally. I've just recently used this one in a project. It's dated but works fine. Just download a more current IP table from MaxMind. You need to check in your GeoIP collection data to see if your IP is already included with null information. Most of the time this is the case. Please note that, when you test this using TestIp.aspx page, it directly sends your request to GeoIP Service directly without looking at your cache or data. That is the reason it works with TestIp.aspx page. Request to the Geolocation service. It works after i added new rule under (/sitecore/system/Settings/Rules/Definitions/Elements/GeoIP/)to check country with country code not country name as already exists in sitecore. 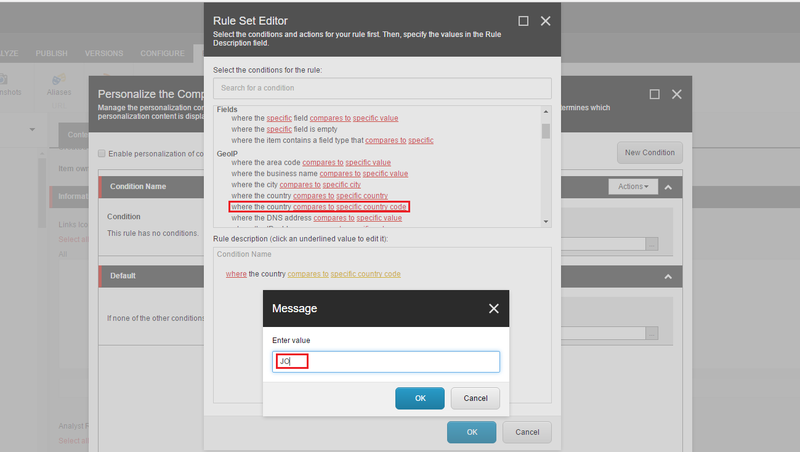 Adding text from rules for Text and Type properties so that users can copy directly from here. Not the answer you're looking for? Browse other questions tagged personalization geo-location or ask your own question. How can I personalize based on geolocation for first page load? How can we work with Geo-IP in local instance?